Throughout the 2016 election, Donald Trump's candidacy stood out for a number reasons. One was the extraordinary numbers of Republican party who denounced Trump. 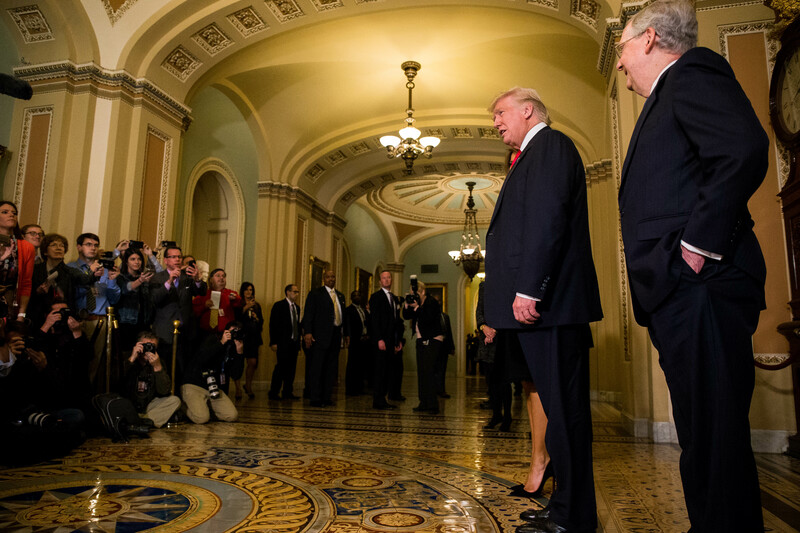 For many in Congress, trying to do their normal jobs, as well as run for reelection in their districts, left them trying their hardest to avoid the topic of Trump altogether. It become a pretty funny sight at one point — Republicans doing anything they could to avoid having to discuss Trump. But the election is over now. Trump won, and he's on his way towards becoming president. He's appointing cabinet officials, his tweets are suggesting potential constitutional crises, and there are massive conflicts of interest concerns regarding his business enterpresises. And many Republicans still have no idea how to deal with questions from the press about Trump. Senator John McCain tried to walk a fine line as he ran for reelection in Arizona this year. He would criticize Trump, such as when he attacked the parents of Humayun Khan, but follow that up by reiterating support for his party's nominee. He'd change the subject often in response to questions, until eventually, after the release of the infamous Access Hollywood hot mic tape, McCain finally rescinded his support for Trump. Asked if Congress had any oversight role on the potential conflicts connected to Trump’s many businesses, Senate Majority Leader Mitch McConnell smiled and kept walking as he headed off the floor late Wednesday night, declining to say anything at all as he got into a private elevator. Senate Judiciary Committee Chairman Chuck Grassley (R-Iowa) deflected a question about Trump’s potential conflicts to an aide. "Do you have an opinion on that?" the Iowa Republican asked, before he too stepped in an elevator. Trump still hasn't actually started governing as president, so there still may be some time for Republicans to figure out a better idea of how they'll deal with him when he actually is president. But they will probably not be able to go an entire four years of just pretending that Trump doesn't exist.